Enerpac designs and manufactures heavy lifting equipment. For more than 60 years, they have combined high pressure hydraulics and controls to deliver intelligent and innovative solutions that maintain the highest level of quality, reliability and safety. As an industry leader, Enerpac can custom engineer a solution for any requirement. Contact Us today regarding your custom heavy lift requirement. Enerpac Hydraulic Gantries are a safe, efficient way to lift and position heavy loads, where traditional cranes will not fit. Super Lift (SL) series: cost effective models that offers control and stability. Super Boom Lift (SBL) series: heavy duty - up to 1200 ton capacity. Mega Boom Lift (MBL) series: hydraulic boom, two leg configuration can achieve lifting heights over 40 feet. 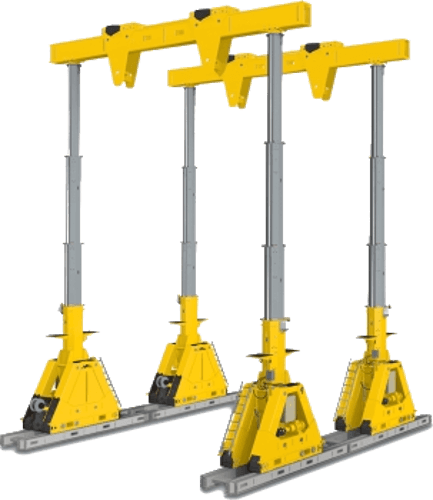 The Enerpac HSL Series Strand Jacks have a capacity of up to 562 Ton. Provides precise synchronous control with heavy lifting capacity in an economical, compact, and reliable foot print. Pickford can provide custom lifts - engineered to fit your unique requirement. Contact us today. Serving Alberta, Saskatchewan, and British Columbia from our 40,000 sq.ft. Edmonton warehouse.